Very rare opportunity to purchase three prime fee simple retail lots in Central Maui. 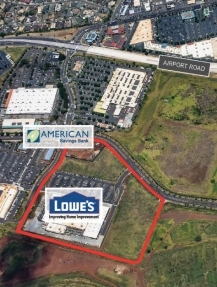 These parcels are located between the future home of American Savings Bank and the brand new Lowes Home Improvement on Ho’okele Street in Kahului. The Parcel has underground utilities, dual private water supply system (potable & non-potable) and County sewer service. These well placed, high traffic locations are suitable for many uses including retail, medical or restaurants.